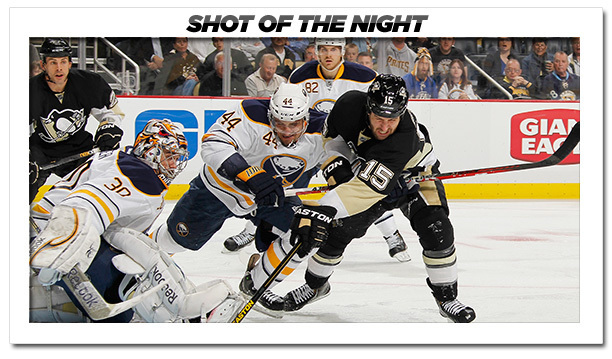 The Sabres halted yet another Penguins winning streak. Buffalo snapped Pittsburgh’s 15-game winning streak on April 2, then stopped the Penguins’ winning streak at seven in their next meeting on Tuesday at CONSOL Energy Center with a 4-2 victory. The loss was just the Penguins’ third in their last 25 games. However, it severely weakens Pittsburgh’s chance of catching Chicago for the President’s Trophy as they remain three points behind the Blackhawks – who have a game in hand. Chicago’s magic number to clinch is two with three games left. Ryan Miller starred in goal for the Sabres, making 40 saves. Marc-Andre Fleury played equally well at the other end and finished with 29 saves, but his teammates couldn’t break through for enough goals against his counterpart. Jarome Iginla and Chris Kunitz scored for the Penguins. Steve Ott scored the game-winner with 2:34 left in the third period while Thomas Vanek tallied two and Jochen Hecht also scored for Buffalo. One issue Iginla had when he first arrived in Pittsburgh was that he kept deferring shots that he should be taking. His new teammates told him they wanted him to shoot more, and it’s a mentality he worked to make routine. Now, 11 games into his stint with the Penguins, that is no longer an issue. Iginla finished with a game-high eight shots on Tuesday’s game (he also had two attempts blocked and two missed shots). The right-handed shot scored his goal with an absolutely gorgeous slapper on his off wing during a power play. Kris Letang put the puck on a silver platter for him, Iginla wound up and blasted a shot past a screened Miller. Iginla now has goals in four straight games and points in six of his past seven games (4G-4A-8PTS). The Penguins got the reigning MVP, a Norris Trophy contender and a viable Vezina Trophy candidate back into their lineup on Tuesday against the Sabres. However, they did lose defenseman Brooks Orpik in the game. He left after the first period and did not return. “Lower-body injury and he will be reevaluated,” Bylsma said of Orpik. Center Evgeni Malkin returned after missing the last four games with a lingering upper-body injury. Malkin, who played on a line with Pascal Dupuis on his left and Iginla on his right, looked fast and strong from the start and like he hadn’t missed any time at all. Malkin worked the puck around the offensive zone like only he can, dangling around opposing players like the Geno Penguins fans know and love. Letang also played after missing Monday’s game with food poisoning (he’s missed a total of 13 games this season due to injury/illness). Letang had to eat extra minutes on Tuesday with D partner Brooks Orpik leaving the game after the first period with a lower-body injury. Letang skated 28:16 minutes in the game. Letang and Malkin assisted on Iginla’s game-tying power-play goal in the third period. The Penguins went 1-for-3 with the man-advantage. Fleury did not travel to Ottawa with the team as his wife is expecting their first child, but started Tuesday’s game in Pittsburgh, his first since April 17 vs. Montreal. Fleury’s best save came in the second period when he stoned Vanek on a breakaway. Rookie winger Beau Bennett also played on Tuesday after sitting out Monday’s game with an upper-body injury. The Penguins are still missing Sidney Crosby (broken jaw), James Neal (concussion) and Paul Martin (broken hand). The Penguins scratched Tyler Kennedy, Steve MacIntyre, Robert Bortuzzo, Joe Vitale, Simon Despres and Eric Hartzell.